History - 800 Black Butte Rd. This page provides a natural and human history of the land at 800 Black Butte Road. The 50 acre property includes large areas of pine plantations, a creek and associated riparian areas, some areas of larger trees, and an open compound, where the Black Butte Center for Railroad Culture is now located. The general area surrounding Black Butte is a gentle gradient pumice plateau that has very few flowing streams. To the north, this plateau wraps around Mt. Shasta and tapers into the Shasta River Valley. To the west, adjacent to Interstate 5, the parent geology transitions rapidly to blocks of ocean floor crust and sediment that have been folded and faulted into their present positions. To the south, the plateau extends past Mt. Shasta roughly to State Highway 89. Most of the forests on this pumice plateau are second growth pine plantations. These are interspersed with brushfields dominated by manzanita and bitterbrush that range in size from a few acres to multiple hundreds of acres. Because of fire history and past logging practices (discussed below) there are very few mature trees or late successional forest stands in the vicinity of Black Butte. There are two attributes that make that make this property unique on the Black Butte Plateau: there is a spring-fed, cold water perennial fish bearing stream and associated forested wetland that bisects the property, and adjacent to this stream, there is a stand of late-successional pine trees that predate the surrounding plantations by nearly a century. These features — a perennial stream adjacent to a stand of late successional pine forest, are unique in the general area. The pine plantations on the other hand are monocultures and because of stand history, have few of the attributes or complexity that would be found in more natural settings. Historically, the property at and around what is now 800 Black Butte Road was a wildland area on the west flank of Mt. Shasta near the Black Butte plug-dome volcano. In addition to the wildlife that continues to inhabit the area today, it is likely that grizzly bears, big horn sheep, elk and wolves were at least occasionally present. The area appears to have been in a transitional zone between the homelands of the native Shasta tribe (to the north) and the Wintu tribe (to the south). There have been some discoveries of arrowheads in the vicinity of the upland meadows near Black Butte Springs just to the east. Given the elevation and the proximity to lower elevation areas to both the north and the south, it is likely the area was used by tribes for summertime hunting and foraging camps rather than for permanent settlements. The land at that time would have had frequent fire return intervals with low to moderate fire severity, exacerbated by the windy conditions of the area. Fuels were discontinuous; snags and down wood were scarce over large areas and long periods of time because of fire frequency. This likely resulted in a combination of areas of early seral brush with a highly variable, multi-aged open forest with scattered stands of larger pine trees, particularly in the area close to Black Butte Creek. The modern history of the land at what is now 800 Black Butte Road has been dominated by two major developments — logging and railroading. Logging by white settlers began as early as the late 1860s/1870s. By the late 1800s, with the coming of the railroad, larger-scale logging operations were taking place. Human-caused fire frequency increased, perhaps significantly, with the arrival of wood and coal-fired steam engines and settlers clearing land. The combination of logging and fires likely created the extensive brushfields that came to dominate the lower slopes of Mt. Shasta and Black Butte. A well-known sawmill operation, Maxwell's Mill, was located near the present day intersection of Black Butte Drive (old Hwy 99) and Black Butte Road. The Southern Pacific Railroad's original mainline, constructed through this area in 1886-87, ran about half a mile west of the land at 800 BBR. Land section 18, where the original 34.4 acre 800 Black Butte Road parcel is located, was not part of the federal land grant to Southern Pacific as it was in an even numbered section so the federal government sold it to private interests. By the mid-1890s the land (as part of a much larger holding) was owned by Abner Weed of the Weed Lumber Company. Weed had started out with a land acquisition near what is now downtown Weed but then expanded his holdings in the area. 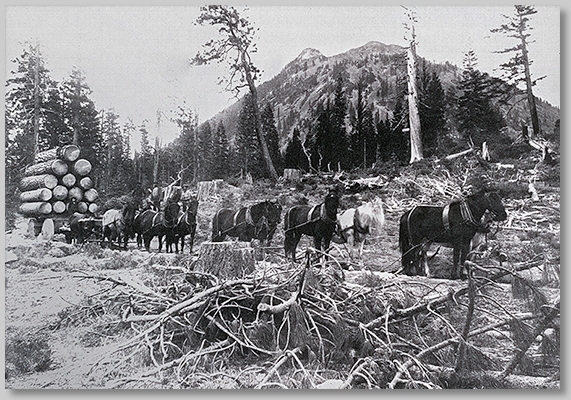 A photo in the Weed Museum shows a horse and mule team of Abner Weed conducting a logging operation in what must have been on or quite near the modern day 800 BBR property. While Abner Weed sold the Weed Lumber Company in 1905, he retained extensive land holdings in the area. In 1917 at the time of Abner Weed's death, the Black Butte area parcel was inherited by his son, Horace. In 1925 Horace Weed, et al. sold a 300' wide corridor to Southern Pacific, along what became the eastern and northern boundary of the property, for the construction of the Natron Cut-off, (a new SP mainline via Klamath Falls) and a small yard/junction which became known as Black Butte Station. A connection to the Siskiyou Line was made at a wye adjacent to the northeast corner of 800 BBR and the original alignment to the west of 800 BBR was abandoned. The construction of the small yard and junction at Black Butte brought increased human activity to the immediate area. Housing for railroad workers was constructed across the tracks from 800 BBR and a small depot was staffed around the clock. The construction of the new rail line likely had a negative impact on Black Butte Creek, which east of the tracks maintains a wide riparian wetland corridor but was channelized into a culvert under the tracks and frontage road. However, long-standing natural diversions just west of the rail corridor have helped to restore and maintain the wide wetland zone west of the tracks. For several decades the land appears to have continued to be owned by lumber company interests. Logging mature pines continued with little attention to reforestation, thus expanding the brushfields that now dominated the landscape. 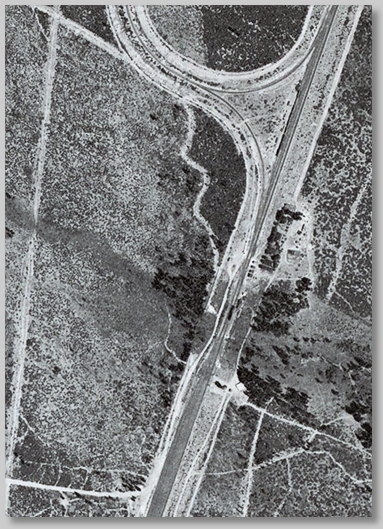 Figure 2 from a 1944 aerial photo shows a large, continuous brushfield with an island of pine trees along the creek in the center of the photo. 800 Black Butte Rd., 1944. Note the "Big Tree Grove"
At some point, apparently in the 1950s, Southern Pacific bought the 34.4 acre 800 BBR parcel — comprising the land in Section 18 west of its railroad corridor and east of Section 13 (which it already owned as part of its original 1880's federal land grant). At the time, SP needed additional yard capacity but its main yard in Dunsmuir could not be expanded due to its constricted location between the Sacramento River and the hillside to the west. The idea was that SP would expand its Black Butte Yard as an alternative. The yard expansion, however, never happened, reportedly because SP later decided that the harshness of the winters at Black Butte would be detrimental to rail yard operations. On July 15, 1971 Southern Pacific Railroad transferred the 34.4 acre 800 BBR parcel to its land management subsidiary, Southern Pacific Land Company (SPLC), which was already managing SP's land just to the west. Lumber companies and the Forest Service were beginning to take a longer term view to put land that was capable of growing trees, but currently occupied by brush, back into a forested condition. The property went into TPZ (timber preserve zoning) in 1972. The next year a massive transformation took place. Other than the riparian area near Black Butte Creek, most of the land at 800 BBR, as well as large areas of SPLC's land in the next section to the west, was cleared of brush. The debris from this clearance, and considerable amounts of topsoil, were piled in long "windrows" — berms that run north-south through the property. The areas in between were then replanted with rows of Ponderosa Pine seedlings spaced at 8 foot intervals. This style of plantation forestry was popular at the time and mirrored with the US Forest Service was doing in developing pine plantations on some of its own land in the Black Butte-Mt. Shasta area. This planting operation was generally successful and succeeded in converting large expanses of brushfield into monoculture pine plantations. The six acre clearing, where the buildings and infrastructure at 800BBR are located, probably dates from this period and it may well have been the logistical base for the plantation development operation. Once planted, the plantation was left to grow on its own. Some parts, particularly on the northeast section of the land, did not do well as a plantation. Many of the seedlings were overtaken by brush and died. In the late 1970s the clearing area was leased by SPLC to the Black Butte Wrecking Yard. By 1981 this was replaced by a sawmill operation, Cedar Pete's. A pond for fire suppression was dug out during this time and equipped with a pump and fire hydrant system. At the same time, the Southern Pacific reduced its presence at Black Butte. The depot was closed in 1966, and then destroyed in a 1971 derailment. The housing of SP employees at Black Butte was phased out. In 1988 SPLC sold its holdings west of the rail corridor. At the time the South Weed truck stop area was expanding and developers were interested in the area's potential for housing and additional commercial development. With these developments in mind, the City of Weed had annexed the land west of the rail corridor and east of I-5, in 1983. The 800 BBR parcel was sold to John Foggy and taken out of TPZ status. While the land to the west was envisioned for housing and light commercial development, the land at 800 BBR, adjacent to the tracks, was seen as having the potential for industrial uses. Foggy appears to have soon leased the property to a second incarnation of an auto wrecking yard business, Black Butte Salvage and Towing. With the sale of the land by SPLC, the management of the land as a tree plantation ceased. By this time the trees that had been planted in 1973 were 15 years old. With the thought that the whole area would soon be developed anyway, no further efforts at brush control, thinning out of the trees or other forestry management interventions were made. By the mid-1990s, Black Butte Towing had developed into a major operation. Hundreds of wrecked cars filled the compound. An impound lot was located near the shop building. In 1997 Foggy sold the land to the owner of Black Butte Towing and his business partners. Soon afterwards, Black Butte Towing initiated a move to a new site. The business partners began looking at opportunities for developing the 800 BBR site. Proposals for an asphalt plant and a water bottling plant (which would have required gaining the water rights and access to Black Butte Springs) were made but eventually fell through. In October, 2006 the property was purchased by Bruce Shoemaker. Shoemaker and a number of his associates established the Black Butte Center for Railroad Culture and subsequently moved a number of historic rail cars to the compound area. By this time much of the land at 800 BBR, due to the legacy of plantation forestry, a lack of subsequent management, and the history of fire suppression in the area, had serious problems, including overstocking of the plantation and large amounts of dead and decadent brush. The result was a severe fire danger and an unhealthy forest with very limited potential as wildlife habitat, few understory plants and poor aesthetics. The stressed and overcrowded trees were increasingly susceptible to pine bark beetle damage. In 2010 efforts at addressing this situation, through brush clearing and some initial thinning, were initiated on a small-scale basis. In 2012 a Boundary Line Adjustment (BLA) was negotiated with the owner of the adjacent land to the west and south, resulting in the addition of 15.6 acres to the 800 BBR parcel, which now totals 50 acres. This land, located in Section 13 and part of SP's original land grant, was in the same poor shape as the plantation areas in the original parcel. In 2013 a three-year program of thinning and fuels reduction/brush control was initiated with support from the Environmental Quality Improvement Program of the National Resources Conservation Service (EQIP/NRCS). This work was completed in early 2015. This has resulted in a substantial improvement in the areas of the property included in the program. However, given the legacy of decades of with no management, there is still much more work to be done. Therefore, a planning process was undertaken in 2015 in order to plan out further work forest restoration work. This is aimed at ensuring the property, at a time of climate change and drought, is increasingly fire-resilient, provides good wildlife habitat and, over time, transitions into a more bio-diverse and healthy forest. For more information on our local ecology and restoration efforts see "creek-home.shtml". For specific work we are doing on forest restoration see "forest.shtml".